Mini Monkeys! Mini Monkeys! Going happy in a game, Mini Monkeys! The world has gone insane, but Pencil Kids is here to set it right with another installment of primate point-and-click puzzling with Monkey Go Happy Mini Monkeys 3. This time, the adventure is on a boat, on a boat, on a monkey-loving boat, and tracking down all of those mischievous mini-monkeys is going to be no cup of grog. As before, the goal is to use your sharp eyes and puzzle solving skills to find fifteen mini-monkeys and place them in the basket, so as to cheer up Mr. Main Monkey. In all honesty, apart from the changes of setting, some players may think that the series is getting a little too formulaic. Personally though, this reviewer would be happy making those chubby-cheeked mammals jump up and down until the end of time (though he wouldn't mind if future installments make clearer what keys are for doors and what keys are for padlocks... A bit of frustrated clicking there). Monkey Go Happy Mini Monkeys 3 is another adorable and accessible work from Pencil Kids, and, having carved out a nice little niche in casual gaming for himself, there's no reason why they shouldn't keep on keepin' on. 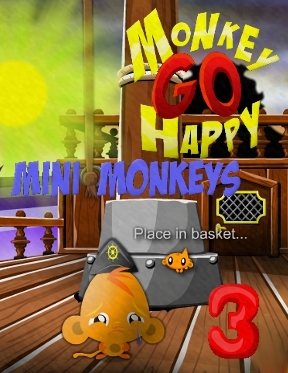 Monkey Go Happy Mini Monkeys 3 Walkthrough now available! Pick-up MINI MONKEY 1/15 from behind the bottom right side of the mast base. Then get MINI MONKEY 2/15 from quarter deck, just behind the left side of the mast. Pull the rope to lower the ladder up to the crow's nest. Climb up the ladder to the crow's nest. Pick-up MINI MONKEY 3/15 who is peeking out from the right corner of the crow's nest. Get the CUTLASS which is on the left side. Click the pully to lower the flag then grab the KEY. Make a note of the single starfish design on the cubby door on the edge of the crow's nest. Climb back down to the main deck. Use the KEY to unlock the captain's cabin door. 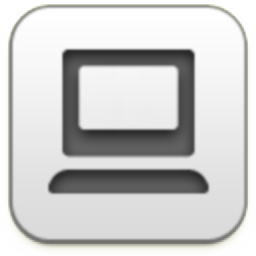 Click the box in the right corner to move it then pick-up MINI MONKEY 4/15. Get the CANDLE from the lantern. Get a CRACKER from the bowl on the desk. Make a note of the two starfish design on the desk cubby door. Go back out to the main deck. From the main deck, go up the stairs on the right. Pick-up MINI MONKEY 5/15 from the ropes on the right. Use the CRACKER on the barrel of "Warm Milk" to get a SOAKED CRACKER. Get the SHIPS WHEEL from behind your sad monkey head. Make a note of the three starfish design on the bulk head. Go back down to the main deck. After getting a soaked cracker, go back into the captain's quarters. Feed the SOAKED CRACKER to the parrot and it will fall asleep. Take the SMALL KEY from around the parrot's neck. Go back out to the main deck and turn left to face the bow. Get MINI MONKEY 6/15 from behind the munitions chest on the left. Just above that, in the ropes, is MINI MONKEY 7/15. Get him. Click the barrel next to the forward mast to turn it over, then pick-up MINI MONKEY 8/15. Note that there is an island in the distance with two signs on it, but it's too far away to see clearly. Use the SMALL KEY to unlock the hatch to below deck. Click the hatch to open in then go down. Use the HOOK to open the munitions chest on the left. Go down to below deck again. Put the CANNONBALL into the cannon. Use the CUTLASS to slash the rope that's tethering the cannon. Use the CANDLE to light the cannon's fuse. Pick-up MINI MONKEY 9/15 from outside the window. Go right, through the hole in the wall. Get the TELESCOPE from the floor by the chest. Grab the TREASURE MAP from the floor in the back of the room. Click the golden crown to turn it over and pick-up MINI MONKEY 10/15. Put the SHIPS WHEEL on the wall then click to spin it once to show a single starfish design on the panel below. Put the TREASURE MAP inside the barrel of "Gun Powder". ... revealing MINI MONKEY 11/15 through another hole in the back wall. Pick him up. Get MINI MONKEY 12/15 from behind the cubby door. Climb back down, turn left, go down, then go through the hole. Click the ship's wheel to turn it again so that a double starfish design shows on the panel below it. Get MINI MONKEY 13/15 from behind the cubby door in the desk. Go back out, turn left, go down, and go through the hole. Turn the ship's wheel one more time to show a three starfish design. Pick-up MINI MONKEY 14/15 from behind the final cubby door. Go back to the main deck then turn left to the bow of the ship. When you enter the correct code, the chest will pop open and you can get MINI MONKEY 15/15. Huzzah! The monkeys are happy! Long after I'd finally shook that tune from my brain, you put it back in, Tricky. Um... thanks? I got all of them with no help or hint or anything. My score was 283. Don't know if that's bad or mediocre. Got it with a score of 118 on the third try. It would be a lot less clicking if the monkeys would just go in the basket when you click them.